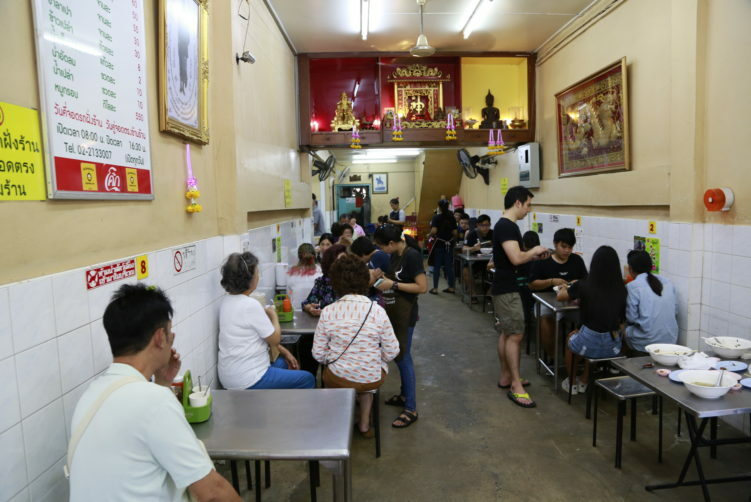 It’s a cacophony of voices repeating each other to lift the crispy pork (Moo Krob) at Mr Joe Crispy Pork as a complete heaven in order to get readers attention. Well, the Crispy Pork isn’t as perfect as the panegyric reviews you can read some places. I’m a bigger fan of their Kuay Jab/Guay Jab. Mr Joe Crispy Pork is absolutely worth a visit. And yes, the crispy pork is absolutely good to very good. That said, I’m more attracted to the broth and the intestines in their Kuay Jab/Guay Jab. But let starts with the crispy pork. The crispy skin is fluffy and delicious, while the rest of the bite is just good. This is of course about preferences. I prefer my crispy pork to have more fat/marbling than the pieces you get at Mr Joe Crispy Pork, which I find a bit hard and dry. If you like very lean meat, it might be that you find the crispy pork at Mr Joe your preferred choice. Nothing wrong in that of course. Just make sure you order something to drink as well. More marbling would have added more taste and juiciness to the meat. I’m not talking a lot more fat here, it’s just that the bites at Mr Joe has too little of it. And when it comes to crispy pork, details really matters. It might be as swearing in the Church, but the result at Mr Joe is less taste and more chewing, but of course it helps with really fluffy and crispy skin. The crispy pork is by the way fried and not cooked in an own. That matters of course. An alternative would be to slow cook the pork and then fry it in the end to get the crispness. Or you can follow my recipe below, just using the own to get both really crispy skin and juicy and tasteful meat. 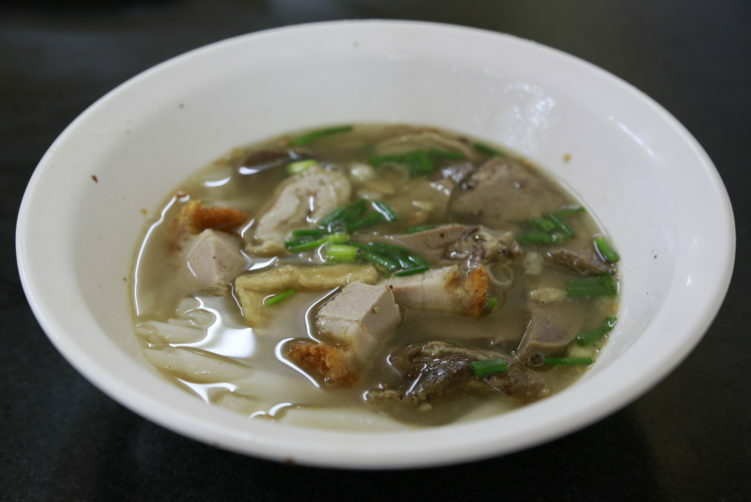 The crispy pork tastes better in the Kuay Jab Nai Sai as the soup adds fluid to the meat while the crispiness of the skin is still there. Kuay Jab is a Chinese dish, but with the years Thai’s have made it their own. I guess it would be correct to call it Chinese-Thai (Sino-Thai) as served in Thailand today. The thing about Kuay Jab is the peppery and meaty broth from an excessive amount of white pepper and quite often a rich garlicky aroma. It is served with curled-up flat rice noodles and different parts of the pig, that includes most inner organs. Kuay Jab Nam Sai is with clear broth, while Kuay Jab Nam Khon is with dark broth. At Mr Joe Cirspy Pork and most other vendors you can choose your Kuay Jab to be with or without intestines. This time I went all inn. To order it without the intestines, you just ask for Kuay Jab May Aow (Kruangnai). 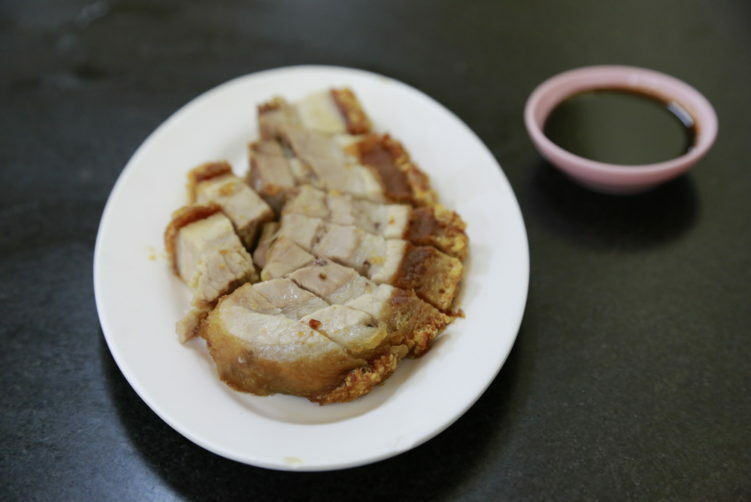 At Mr Joe Crispy Pork it is easy as it is specified on the menu. The broth at Mr Joe Crispy Pork is definitively on my top five list for this dish in Bangkok. The intestines are tender and flavorful – liver, heart, lungs, colon, skin and a few more things. Crispy pork and other meaty parts are added. I would call it a good spot for trying intestines if you haven’t tested it before and is a bit skeptical about it. Don’t forget to add chili flakes, but be careful as they are potent. Vinegar is also a good idea, at least I use it. buy generic viagra online no prescription Price: I paid 122 bath for a bowl of Kuay Jab Nai Sai with intestines, a plate of Crispy Pork (55 bath) and a bottle of water. How to get there: You can take the BTS to Saphan Taksin where you change to taxi. 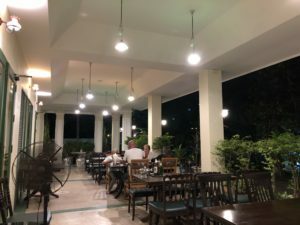 An alternative is to go for canal taxi on the Chao Phraya river that you will find under the bridge to the other side of the Chao Phraya river. The closest pier is Wat Worachanyawas. From there you walk to the main road, Charoen Krung road where you take to the left and cross over to the other side as soon as you can, then continue until you get to the road cross to Chan road. There you take to the right and cross the road to the other side. You find Mr Joe Crispy Pork about 200 meters into Chan road. It will be a 10 minutes walk from the pier. Mr Joe Crispy Pork is worth a visit. And yes, the crispy pork is good to very good. That said, I'm not joining the cacophony of voices talking about perfection. Im much more attracted to the broth and the intestines in their Kuay Jab/Guay Jab. I also give you a recipe for the perfect crispy pork. See full review at StreetsideBangkok. Normally I haven’t focused on recipes on my blog, but I do an exception here. Follow this recipe and you have the loveliest crispy pork you ever had, in addition to really juicy meat. I use the same recipe for pork ribs between 2 and 4 kilos. What you need to make perfect crispy pork is time and quality pork. Go for ecological produced pork if you have the option. The taste is miles ahead of any industrial produced pork that you get 95 % of the time in Bangkok. Place the pork rib in a pan skin side down – level two out of four, so just a bit below center of the own. Throw in plenty of garlic and fill the pan with heated water until it covers the skin and fat layer under the skin. Let it stay in the own for 45 minutes. Take the pan out of the own and reduce the own temperature to 80 degrees. Then remove the pork rib from the pan and build up a mountain of aluminum folio, or preferable something more environmental, in the middle of the pan. The point is to make sure you rally can curve the pork rib around this mountain. As the skin has been cooked for 45 minutes the skin is much softer and it will opens up around the squares you have cut. This is important to get crispy pork skin as it allows the melted fat under the pork skin to run of. Put the pan with the pork rib back in the own that should be 80 C now and leave it for at least 10 hours. This could of course be done over nigh if you prefer. About 1 to 1,5 hour before serving, raise the temperature to 180 C and let it get some color, about 30 minutes. when the pork rib have gained a good color raise the temperature to 250 C until the pork skin pops. You really need to pay attention as it can happened very fast. This is of course a different method than frying the rib, but re result is far better as the meat is much more tender and juicy.